The Dynamite Passport P1 Mini Charger is a great, compact multi-chemistry charger for the money, but the manual that comes with it is not only hard to follow, but also loaded with inaccuracies. Like many chargers before, we decided to fix Dynamite’s broken manual and create a guide of our own. First, let’s define what a “multi-charger” is. What is a multi-charger, you ask? I will define it as a charger capable of charging multiple chemistries of batteries, including Lithium-Polymer (LiPo), Lithium-Ion (Li-ION), Lithium-Iron Phosphate (Li-FE), Nickel Cadmium (NiCd), Nickel-Metal Hydride (NiMH), and Lead-Acid (Pb) Batteries. Most modern multi-chargers also have the built-in ability to balance LiPo cells, and the better chargers also have a LiPo storage function. Additionally, they should all be capable of minute adjustments in charge current, ideally in increments of 0.1 Amps. There are various other attributes that some multi-chargers have that are not necessary for most users. Some are AC and DC powered, meaning they can plug into the wall or hook up to any 12V source and be used. Some are DC-only, and require a 12V power supply for use at home. Some charge more than one battery, and some don’t. Some of these attributes are nice to have, but not necessary to fit my definition of ‘multi-charger’. This is the screen that you will eventually get to when the battery is charging. Battery Type: This indicates the type of battery you are charging. In this specific case, we’re charging a two-cell Lithium-Polymer battery, otherwise known as a “2S” LiPo. Charge Rate: This indicates the current charge rate. Even though you might set it to a specific number, it will change over time, depending on the battery you are charging. Battery Voltage: This shows the current battery voltage. This is not necessarily indicative of the voltage upon unplugging the battery from the charger, since there is almost always a tiny amount of current flowing into the battery, which may inflate the value slightly. Function: This shows whether you are charging, balance charging, discharging, or storing your battery. Time Elapsed: Shows the time elapsed since the charge began. Capacity Charged: This value is the total amount of mAh the charger has put out. It does not accurately indicate the amount of mAh the battery has retained, so this is just gives the user a ballpark idea of the charge level. Make sure that your charge lead is plugged into the charger, and verify that the polarity is correct. Red should be plugged into red, and black into black. Do this before plugging your battery into the charge lead to prevent any short circuit of the battery. LiPo balancing (which we will get more into later) requires the use of a balance lead. The Passport P1 Mini has a balance port built-in to the front of the charger. You can see a battery’s balance lead plugged into the balance port here. Make sure you have the correct charge lead plugged into the charger, otherwise you won’t be able to charge your battery. The Passport P1 comes with an EC3 charge lead. If you need a different connector, be sure to buy the proper charge lead from your local hobby shop, whether you use Traxxas plugs, Deans Plugs, XT60s, Power Poles, or anything else. If the balance lead on your battery is too short, you may need to pick up a balance extension, like the one in the above photo, from your local hobby shop. NEVER CHARGE A BATTERY UNATTENDED! While these chargers are very advanced, there are still many things that can go wrong. Following all the proper protocols will prevent most accidents. But just as being a safe driver doesn’t prevent 100% of accidents from occurring, following the proper instructions won’t prevent a fire or some other unfortunate incident. Be close enough to react to any hazard that may crop up. Have a fire extinguisher nearby. For LiPo batteries, charge them in a fireproof container, whether it’s a LiPo Sack or a ceramic pot – anything that will contain a fire. These safety tips aren’t meant to scare, but it’s better to be safe than sorry. Most chargers that run this firmware have a Capacity Cut-Off enabled from the factory. This is a safety mechanism that will shut the charger off when the battery reaches a certain capacity charged. This cap is usually 5,000mAh. Depending on the battery you’re charging, this can be problematic. In the instance that we are charging a well used 5000mAh LiPo, it’s certainly possible for the charger to need to put out 5000mAh – 5500mAh to fully charge the battery. This is because nothing is 100% efficient. The charger can only measure what it puts out, not what the battery actually absorbs. The rest of that energy is released from the battery as heat, which is why batteries heat up when being charged. If the charger cuts off at 5000mAh, but the battery requires a bit more energy to fully charge, you’ll never get a full charge on your battery. 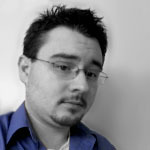 But there is a way to fix this, and raise the cap up to a manageable level. Let’s do that now, so we don’t have to worry about it in the future. 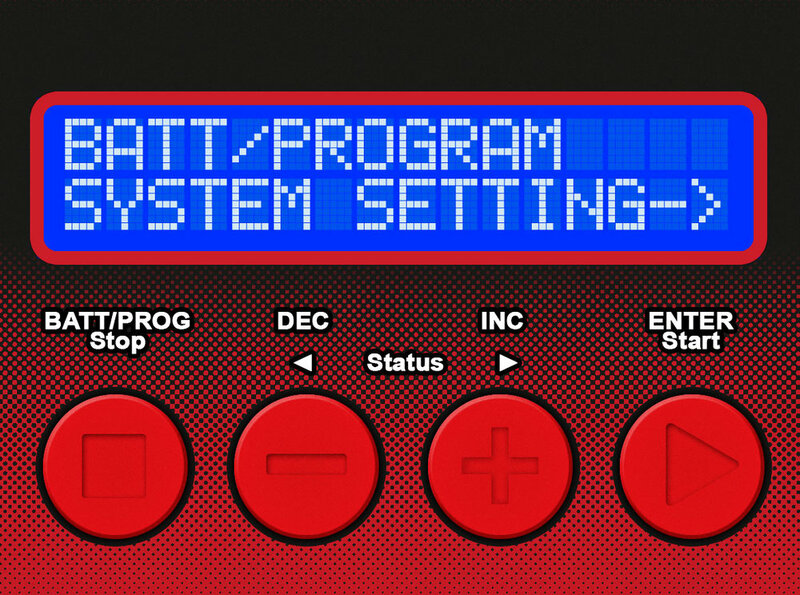 Press the [BATT/PROG] button until the menu doesn’t change anymore, then press either the [DEC] or [INC] button until you see this screen. Press [ENTER] to go to the next screen. This should be the screen you are presented with. Press the [INC] button once. This is the Capacity Cut-Off screen. We want to leave the cut-off on, but raise the limit. Let’s start by pressing the [ENTER] Button. The “ON” will begin to blink. Press [ENTER] again to move on to the capacity. Now that the “5000mAh” is blinking, press the [INC] button to increase the capacity. Let’s set it to 6000mAh. Once you’re there, press [ENTER] once more, and the change saves. You can now press [BATT/PROG] to get back to the main menu. NiCd and NiMH batteries are probably the easiest type of batteries to charge on a multi-charger, since the charger will auto-detect the number of cells, and the only variable is the rate of charge. For this walkthrough, we’ll assume the battery is a 6-cell (7.2V), 1800mAh NiCd battery. 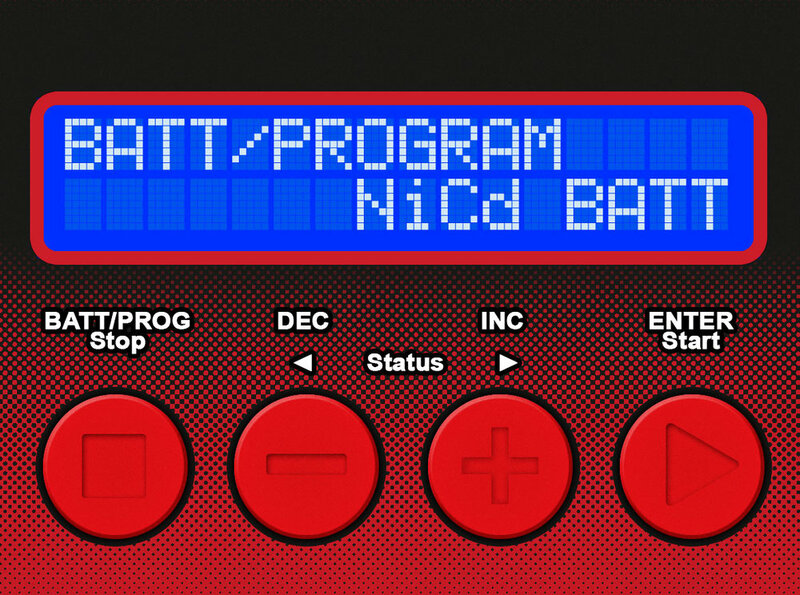 Press the [BATT/PROG] button until the menu doesn’t change anymore, then press either the [DEC] or [INC] button until you see this screen. Press the [ENTER] button. You should have the battery plugged in at this point. This screen should show up, in some variation. The number followed by the “A” could be anything from 0.1A to 6.0A. Press the [ENTER] button again. The 0.1A (or whatever number is in that place) will start to blink. For this 6-cell 1800mAh battery, I usually charge at a 3.0A rate. 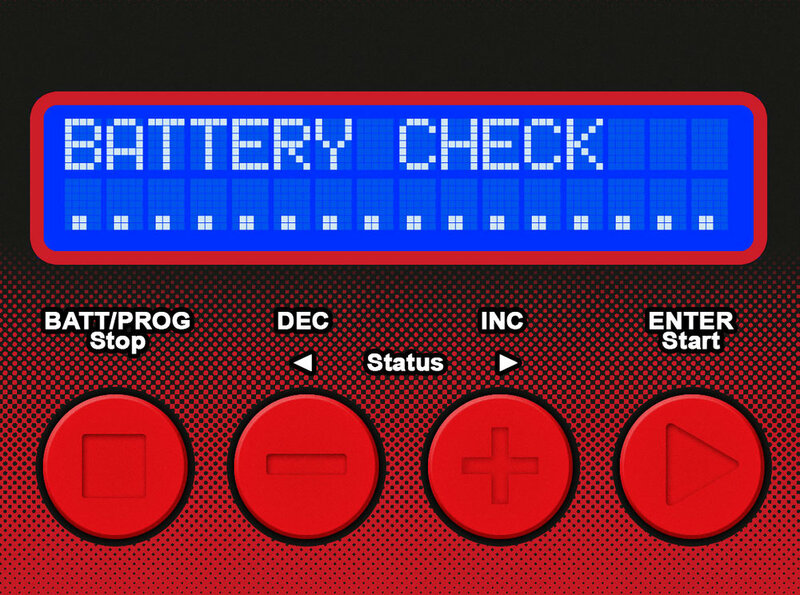 Check your battery to see if it requires a specific charge rate. 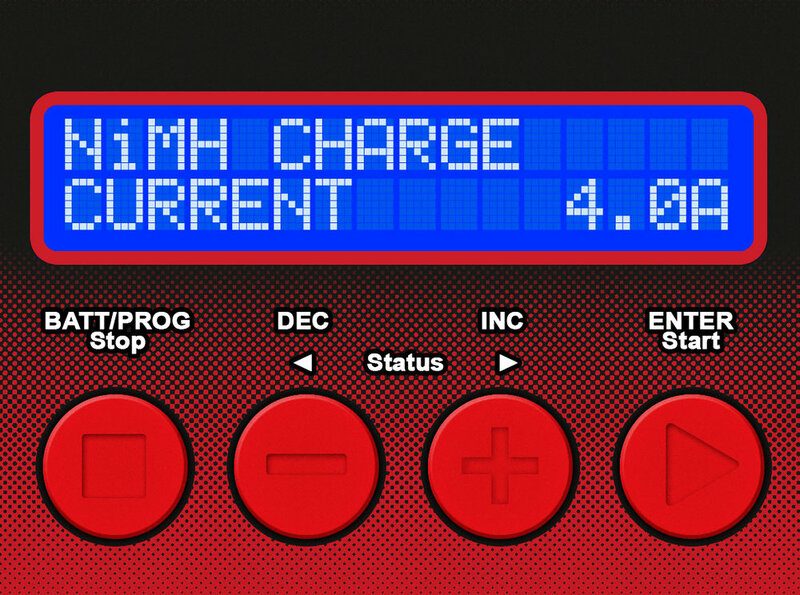 Use the [INC] or [DEC] buttons to select your charge rate. It will go up or down in increments of 0.1A. Once you’re at the correct charge rate, press and hold the [ENTER] button. When you press and hold [ENTER], the charger will beep and flash this message to you. Then it will proceed to the next screen. You’re charging! The charger will beep when it detects a full charge on the battery. NiMH batteries are what most beginners in the R/C car or truck will use at first, and come stock in almost every vehicle that includes a battery. For this walkthrough, we’ll assume the battery is a 7-cell (8.4v), 3000mAh NiMH battery. For this 7-cell 3000mAh battery, I usually recommend a charge rate of 4.0A; you can charge it slower, but I wouldn't charge it any faster than that. Check your battery to see if it requires a specific charge rate. You’re charging! The charger will beep when it detects a full charge on the battery. Remember, never charge a battery when you aren't around; it's not safe! LiPo batteries require more care and attention than their older brethren. I do cover this in much more detail in my article, A Guide to LiPo Batteries, but I want to cover a few of the details relevant to charging, balancing, and storing the batteries in this article as well. Balancing is a term we use to describe the act of equalizing the voltage of each cell in a battery pack. 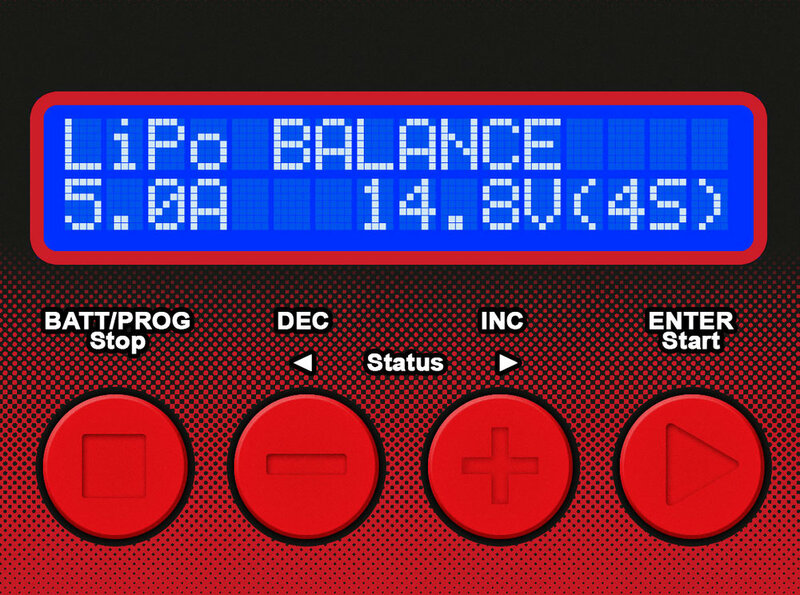 We balance LiPo batteries to ensure each cell discharges the same amount. This helps with the performance of the battery and helps maintain the battery’s health. Since all of the chargers this article is about have a built-in balancer, it would be silly to not use it. I recommend balancing your LiPo battery every time you charge – not because you have to, but because it makes sense to get in the habit. That way you never have to worry about forgetting when you last balanced the battery. 3000mAh = 3A = "C"
So, for a 3000mAh battery, we would want to charge at 3A, for a 5000mAh LiPo, we should set the charger at 5A, and for a 4500mAh pack, 4.5A is the correct charge rate. Some batteries like the Dynamite Reaction line we carry here in our store, can be charged faster than 1C. Always make sure your battery is capable of being charged at a higher C-rating before doing so — you could have a fire on your hands if you don't! If your battery doesn't specify the proper charge rate, always assume it can only be charged at 1C. In the old days, we used to run our cars or airplanes until the batteries died, then just set the batteries on the shelf at home, waiting for the next time we could use them. We just stored them dead. But you should not do that with LiPo batteries. Nor should LiPo batteries be stored at full charge, either. For the longest life of the batteries, LiPos should be stored at room temperature at 3.8V per cell. All of the chargers discussed in this article have a LiPo Storage function that will either charge the batteries up to that voltage, or discharge them down to that voltage, whichever is necessary. I recommend to our customers that they put their LiPo batteries in storage mode after every run. This isn't necessary per se, but it does build up good habits. If this is done every time, you don't have to worry about whether or not you remembered to put it in storage. I have had many customers come to me with batteries that died because they charged it up, intending to use it, but life got in the way and they never remembered to put it back to storage voltage. Lithium-Polymer batteries can be damaged by sitting fully charged in as little as a week. So don't forget to put your LiPos at storage voltage when you're done using them. Now that we have that out of the way, let’s get on to how to charge and store our LiPo batteries. LiPo batteries require a bit more work to charge and balance, so this is going to take a few more steps than NiMHs or Ni-Cds, so let’s get to work. In this example, I will use a common battery we sell, a 5000mAh, 2S (2-cell) LiPo. You should have both of your battery's leads plugged into the charger at this point. Again, you should have the battery plugged in both to the main charge lead and also to the balance port. This screen should show up, though there may be different numbers on the screen — this doesn’t matter, because we will be changing the values anyway. The key here is to see “LiPo BALANCE”. Press [ENTER]. The value in where “0.1A” is should start to blink. Using the [INC] or [DEC] button, change the value according to your battery. Since we are using a 5000mAh in our example, we’ll be inputting “5.0A”. Use the formula below to determine the proper charge rate for your battery. Once your proper value is in place, press [ENTER]. The value in the “4” of “4S” will start to blink. Now we need to select the correct cell count. Match the voltage up to the battery you have. In this case, we’ll select 7.4V(2S). Use the [INC] or [DEC] buttons to select your cell count. Once you’re at the correct cell count, press and hold the [ENTER] button. When you press and hold [ENTER] as instructed, the charger will beep and flash this message to you. Then it will proceed to the next screen. This screen is trying to make sure that you entered everything correctly. It’s saying you submitted 2 cells in series and it reads 2 cells in series. When you are charging LiPos, both of these values have to match. If they do, press the [ENTER] button once more. If the values don’t match, press the [BATT/PROG] button and fix your mistake. Then repeat back to this point. This screen is timed, and after a few seconds of no input, will revert back to Step 4’s screen automatically. Assuming both values matched and you pressed the [ENTER] button, you will see some variation of this screen. The battery is now officially charging! It will beep when it’s done. If you want to stop charging for any reason, press the [BATT/PROG] button before unplugging the battery, except in an emergency. While the battery is charging, there are a couple other screens you can pull up for more information on how your battery is doing. Check out the figures to the right. If you want to check the status of the individual cells, press the [INC] button. Here, you can see the voltage of each cell in your battery. Here, the voltages read 3.85V and 3.85V; the LiPo is perfectly balanced. Since this is only a 2-cell battery, we're only seeing two values and everything else is just "0.00V". With a higher-cell count battery, you would see more of those zero values populate. You can press [ENTER] again at any time to view the previous screen, or press [INC] and check out the next screen. This screen is unique amongst all the chargers we’ve previously carried. It’s a “fuel gauge” to give you an at-a-glance idea of how full the battery is. Personally, I don’t find it very useful, but your mileage may vary. Press [INC] to go back to the previous screen, or press [ENTER] to go back to the main charging screen. That is how to balance charge a LiPo battery. Next we will look at another important aspect of owning a LiPo battery: storing them properly with the LiPo Storage function on your Passport P1. Storage mode works just like charging. We set the numbers, make sure everything is plugged in, and the charger will beep when it’s done. You do not need to leave the battery plugged in until you use it again, nor should you. It’s best to unplug the battery as soon as the charger lets you know the battery is done. Let’s get to work. In this example, I will use the same 5000mAh, 7.4V (2-cell) LiPo as before. 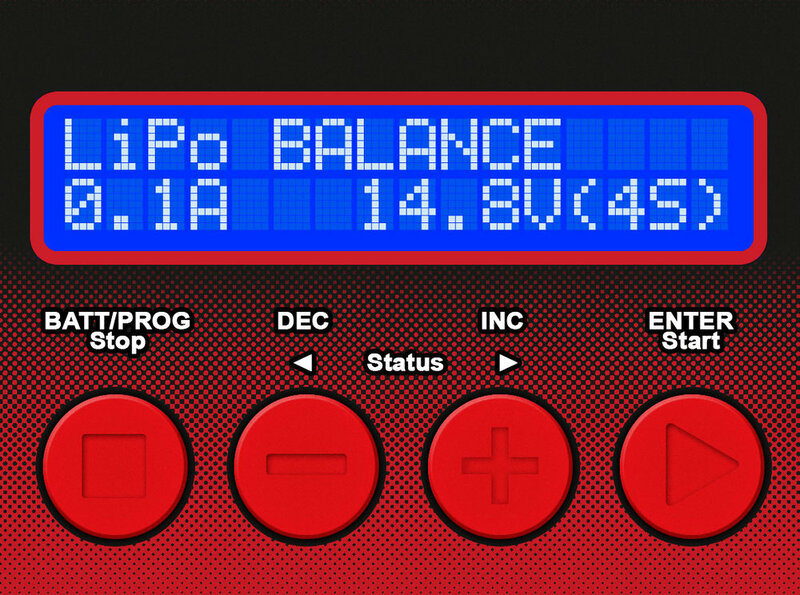 This is the LiPo Balance screen, like we saw above. Since we're working on LiPo Storage, however, this isn't the screen that we want. Press the [INC] button three (3) times. It you pushed the [INC] button three times in the previous step, you should see this screen. Again, the numbers may be different – that’s fine. We will change them to suit our needs anyway. Press [ENTER]. The "0.1A" should start blinking. 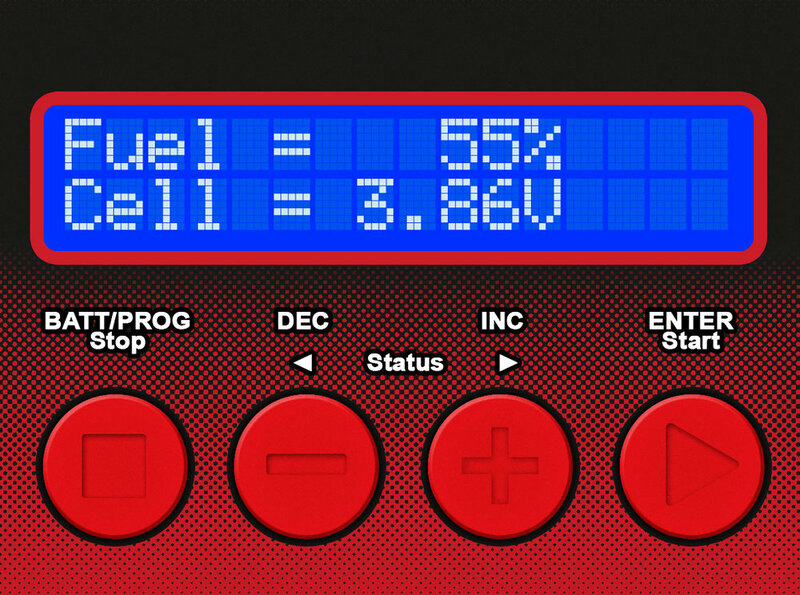 Press the [INC] button enough to get the charge/discharge rate up to the correct charge rate of the battery, in our case, 5A. Press the [ENTER] button. The "3.7V(1S)" will start blinking. Just like when we balanced charged the battery, we need to select the correct voltage and cell count. Our example battery is a 2-cell LiPo, so that means we're setting it for 7.4V(2S) using the [INC] or [DEC] buttons to increase or decrease the value, respectively. Once everything is correct for your battery, press and hold the [ENTER] button. As with balance charging, this screen is trying to make sure that you entered everything correctly. It’s saying you submitted 2 cells in series and it reads 2 cells in series. When you are charging LiPos, both of these values have to match. If they do, press the [ENTER] button once more. 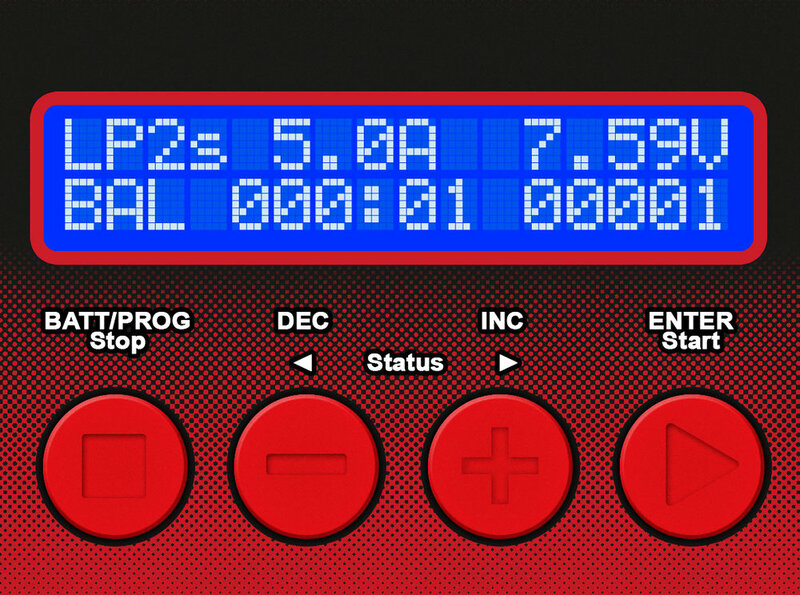 This screen is timed, and after a few seconds of no input, will revert back to Step 5’s screen automatically. You might notice the “1.0A” charge rate. Because the discharge circuit on this charger is less powerful than the charging circuit, the storage is capped at 1.0A. The charger is now putting your battery into storage mode, either charging or discharging as needed – it will figure out what needs to be done. It will beep when it’s finished, just like when charging. You can always press [INC] to see the status of each cell. And that’s Storage mode on your Passport P1. Nothing mystical, just a great feature that you now know how to use. We’ve gone over the most basic functions of the Passport P1. Now that you know how these basic mechanics work, you should be able to easily figure out the rest of them as needed. Your new charger does many, many things – most of them you will never use, and going through all of them would probably be a waste of time for most people. But do explore all the menus in the charger, and familiarize yourself with where they are should you ever need to get to them for something. But more importantly, get that battery charged and go have fun! Don’t forget to talk to your local hobby shop with questions, or contact us. We’ll be happy to help!